One of the most blame when your weight is getting bounced metabolism. However, do we know if the metabolism is it exactly? sluggish metabolism so that calories tend to be stored in the body. Muscle: Muscle is a fat-burning machine, the more the muscles that form the burning of calories from fat is also growing. Frequency of eating: Eat in frequency often to avoid reduction in metabolism and keep blood sugar levels stable. Level of activity: It is also important but it should be combined with proper diet and frequency of eating that often. Choice of food: Fatty foods are metabolized so hard to make the slower metabolic rate. Sufficient water: Water helps the body's metabolic processes. day-to-day, your metabolism will be slow. The truth is setting the type of food. Reducing calories suddenly will ruin your metabolism. A diet which is very less or consume foods that ruin your metabolism as high sugar foods, low in protein and high in fat metabolism Improving actually simple, but not easy. Need dedication and knowledge to improve your metabolism. Begin to adjust your diet with high protein, high in fiber and start lifting weights. Undoubtedly your BB down, well formed muscle and fat will be lost. The benefits of protein for the body is huge. The content of protein in the human body reaches 1/6 of the weight of the human body. Protein is essential for the development of every cell in the body and also to maintain immunity. As one of the nutrients that are needed by humans, protein is very important in its infancy. Adequate protein intake can also help in the process of wound healing, cell regeneration to regulate the hormones and enzymes in the body. Protein also has a major function in the body to form a network with the amino acid content. Protein deficiency in children can cause growth disturbance. In addition, protein deficiency can also cause diseases such as kwashiorkor and marasmus. Some sources of protein such as milk, meat, fish, eggs, corn, potatoes, seed plants. 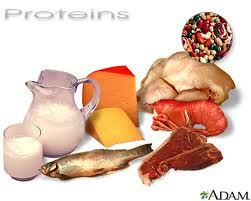 Protein is also divided into two, namely vegetable and animal proteins. Both are equally important for the body. Animal protein is a protein derived from animals. Raw foods contain proteins such as meat, eggs, and dairy animals. While the vegetable protein is a protein derived from plants, such as fruits and nuts. Although protein is needed for the body, but the intake of other nutrients must keep your attention. Make sure your protein intake is adequate daily protein for maximum benefit.